There is certainly no shortage of hype swirling around Guardians of the Galaxy Vol. 2, which was bolstered even further last month when reports surfaced that the superhero sequel scored a rare perfect 100 during a recent test screening, which had never been achieved with any Marvel Studios movie before. Earlier today, perhaps playing into his own movie's hype, Chris Pratt decided to release a hilarious statement regarding Guardians of the Galaxy Vol. 2, which makes a few humble claims about the movie. Here's what the actor, in character as Star-Lord, had to say in his statement below. "On May 5th the greatest movie in the history of movies is coming. There has never been and will never again be a movie like this. Seriously. Ever heard of Citizen Kane? We're much better. Seriously. Our movie just tested at over one million points. Rotten tomatoes already has it at 234% fresh. #GotGVol2 will win every movie award AND about 39 Olympic gold medals in swimming, gymnastics, the skiiing event with the gun, x games, snowmobiling and everything. It will win the World Cup and about 7 super bowl rings, sorry TOM Brady. This movie will fry your brains and lift your spirits. James Gunn will be elected president of the world. They will add the faces of the guardians to Mount Rushmore for sure. We're gonna get a planet. May 5th will become a national holiday. Everyone will get pregnant. Candy will fall from the sky. Global warming will stop. Dinosaurs will come back to life. Which unlike some movies might tell you, is actually a really good thing. Because they won't flip out and kill people instead they'll be your awesome pets. So basically get your tickets as soon as you can. 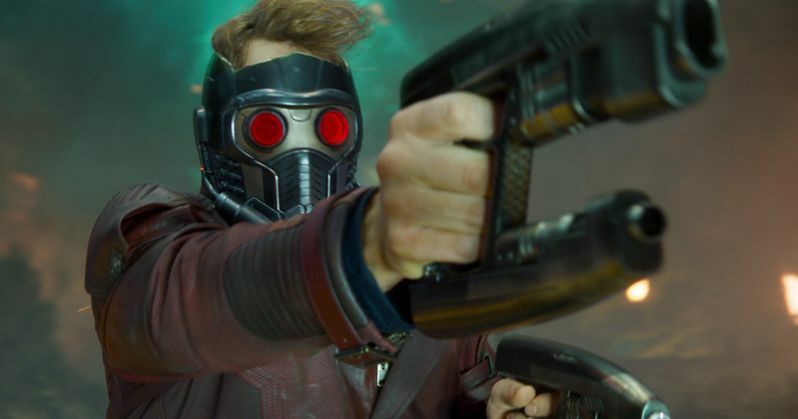 Don't be the only person on the planet who doesn't see this movie Humbly, Starlord"
While the actor is obviously being facetious with this message, which he posted on Facebook while sharing the new IMAX poster, there is no doubt that this superhero sequel is shaping up to be one of this year's biggest blockbusters. Early tracking numbers revealed that Guardians 2 is eyeing an estimated opening weekend of $160 million, a whopping increase over the $94.3 million opening weekend that Guardians of the Galaxy earned in the summer of 2014. While that movie was seen by some as Marvel's first potential flop, it went on to gross $333.1 million domestically, the second biggest movie of the year, just behind American Sniper. Set to the backdrop of Awesome Mixtape #2, the Guardians of the Galaxy sequel continues the team's adventures as they traverse the outer reaches of the cosmos. The Guardians must fight to keep their newfound family together as they unravel the mysteries of Peter Quill's true parentage. Old foes become new allies and fan-favorite characters from the classic comics will come to our heroes' aid as the Marvel cinematic universe continues to expand. James Gunn directs Guardians 2 from his own screenplay, with Kevin Feige producing. The Guardians are also set to return in Avengers: Infinity War, which is currently filming and set for release on May 4, 2018. The ensemble cast for Guardians of the Galaxy Vol. 2 is lead by Chris Pratt as Star-Lord, Zoe Saldana as Gamora, Bradley Cooper as Rocket, Dave Bautista as Drax the Destroyer and Vin Diesel as Baby Groot. New cast members coming aboard for this sequel include Pom Klementieff as Mantis, Elizabeth Debicki as Ayesha, Chris Sullivan as Taserface and Kurt Russell as Star-Lord's father, Ego the Living Planet. The film also marks the return of Michael Rooker as Yondu, Karen Gillan as Nebula and Sean Gunn as Kraglin along with Sylvester Stallone, whose character hasn't been revealed yet, but he is said to be quite important. While we wait for more on Guardians of the Galaxy Vol. 2, take a look at Chris Pratt's social media posts below.